Student stress is real. If you have a student who is experiencing stress related to school assignments, schedules and other activities, then you probably have tried the most common recommendations to reduce accumulating stress including time management strategies, eating healthy, getting plenty of rest, etc. One over-looked approach to lowering stress is by helping your student identify the learning strategies that work best for her to successfully master all the different academic materials. Everyone learns differently. While some students are visual learners, others are auditory or tactile learners. To lower student stress levels, it is very helpful for students to become more aware of their own learning styles and then develop strategies for dealing with the diverse demands of school and of life in general. Below is a chart that illustrates the process of learning. This is my favorite learning style model that I studied during my doctoral course work in Instruction and Learning. In this diagram, we see that learning is a continuous process. 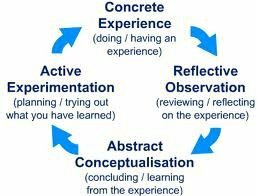 The process begins with a concrete experience, which then leads to reflection about the experience. Upon reflection, the learner begins to form generalizations which can be then tested in new situations. 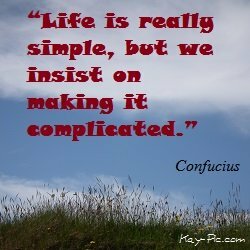 All of us feel, reflect, think, and do, but we linger at different places along the way in this learning process. The area within this learning process where we linger and feel most comfortable is usually the style of learning we prefer. Differences in our learning styles depend on many things: who we are, where we are, how we see ourselves, what we pay attention to, and what people ask and expect of us. Follow this exercise to discover the learning style patterns that your student prefers. Take out a pad of lined paper, and at the top of each sheet of paper, write the name of the academic course your student is studying. List the last 5 assignments for each course of study, leaving room to write notes. Beside each assignment list the various strategies used by your student to learn the new materials [memorizing class notes, using flash cards, outlining the textbook chapters, working in a study group, setting up problems to solve, etc.]. Note which of these strategies were successful in mastering the materials and which were not. What were the most effective ways in which your student approached and mastered an assignment? Are there different strategies that are effective depending on the subject matter (learning math vs. learning history, for example)? After noticing the learning patterns, review what area of the learning cycle your student seems to feel most comfortable. Because the student enjoys spending time in these areas of the learning cycle, these have probably become the student’s learning strengths. There are many ways to approach learning new information. Knowing your own learning style can eliminate a lot of the student stress associated with learning new information. We all have a preferred method of learning, but most often teachers in the classrooms, teach using only their preferred style of learning—usually reflective thinking and identifying generalizations. Those students who do not have the same learning style as the teacher may find the experience frustrating and find that they have a more difficult time learning the material than those who would have the same learning style as the teacher. Students who need to be actively involved in the learning process are often challenged with school learning. A good strategy to use is to partner with another student who has different learning strengths so that they can complement each other as they learn the instructional materials and lower student stress for both.